Originally published on WebMarketCentral between August 2008 and September 2009. Somewhat similar to tools like Basecamp and Projjex, DeskAway is an online collaboration tool that supports ad hoc work teams by enabling them to manage and track projects, share large files, send secure messages and report on activities. Pricing ranges from free (up to five users and three active projects at a time) to $99 per month for unlimited projects and users. Gickr is a slick free tool for creating animated GIFs from any collection of photos. It can be used to create banner ads, slide shows or Flash-like animations. This is a “connected thesaurus” that belongs in every writer’s toolbox. For any word or pair of words, it shows related words, connections between the words, rhyming words and more. For famous names, it can help find information such as occupation, birth and death years, nationality, and “trigger links” (e.g. “Clinton” and “Whitewater”). OnlyWire lets you automatically submit content to all of your favorite social networking sites with a single button, and makes it easy for your blog readers to bookmark and share your content. If you don’t want to see their ads, a fee-based version is available for a reasonable $25 per year. Frequent Best-of contributor Darren Rowse reviews essential blogging tools including SnagIt for capturing screen images, Digsby for consolidating social networking chat with a single tool, Camtasia Studio for screen recording, PeaZip for file archiving and unzipping, and a dozen others. In one of the most underrated posts of last year, Jon Miller provides links to more than 60 tools and information resources including blog posts, white papers, analyst reports, webcasts, podcasts, ebooks and articles on topics ranging from lead scoring and nurturing to marketing ROI and social media tools. Examples include David Raab’s Guide to Demand Generation Systems, Marketo’s Landing Page Test Calculator and this podcast from Laura Ramos on using Web 2.0 tactics to boost b2b marketing results. The indispensable Ann Smarty reviews nine helpful bookmarlets (small tools activated from a button in your browser), such as Search selected text on Google and tools for Google Trends, Google Insights, and Google Blog Search. While there are lots of website analytics programs out there, Clicky combines powerful functionality with affordable pricing in a way few others can match. Unlike Google Analytics (the application it’s most likely to be compared to), Clicky provides real-time stats, Twitter analytics, separate mobile visitor tracking, visitor details, WordPress integration and more. While their free and blogger plans offer limited funcitonality, their Pro ($60 per year as of this writing), Super Pro ($120/year) and Enterprise ($300/year) plans offer impressive capabilities at very reasonable cost. It’s hard to compete with free, but with all of these features and great value, Clicky has found a way to do it. Facesaerch (yes, that’s the correct spelling) is just what its name implies: a search engine specifically for faces. Search for your favorite celebrity, a neighbor, your boss, your next prospective employee—anyone whose picture may be somewhere on the internet—to discover what photos of them have been posted and where. Animoto lets you grab images from your hard drive or the web, choose a soundtrack from your audio collection or theirs, and then automatically creates a cool music video from your selections. While this tool would benefit from more attractive pricing (you can only make 30-second videos for free) and better controls, it’s worth checking out and playing with. Josh Dreller reviews seventeen helpful Firefox plugins, such as FireFTP (a fully functional and free FTP client that runs within Firefox), FireShot (a free screenshot capture tool with annotation capabilities), SearchStatus (a “Swiss army knife” for SEO pros) and Google Global (lets you search as though you were sitting anywhere in the world). Prolific SEO blogger Ann Smarty reviews a half-dozen SEO diagnostics tools including Quarkbase (a new addition to my arsenal), HubSpot’s Website Grader (one I use all the time), and Cubestat. AN Jay reviews a variety of helpful and cool online tools here, from free web conferencing service Dimdim and URL shortener BudURL to Skydeck (an online tool for keeping track of your cell phone calls and text messages) and PDFescape, a free online PDF reader / editor / form filler and form designer tool. This is an essential site for personal online reputation management. LookupPage lets you create an optimized personal profile that, in most cases, will show up very highly on the major search engines, helping you to “own” valuable first-search-page real estate for your name. The site offers free listing, as well as couple of affordable fee-based options that provide additional benefits such as an ad-free page and top listing guaranteed. Another valuable site for reputation management, Retaggr not only enables you to create an online profile linked to your accounts on other social media sites, but also lets you easily create an online business card, social media email signature, and blog widget to help visitors easily add you to their friend lists. An alternative search engine, Exalead may not be a “Google killer” but does provide some interesting features. The top menu and right sidebar box make it simple to narrow your search to the entire web, just your PC, or Wikipedia, as well as by related terms, site type, media type and other criteria. Either a slick tool to help generate domain name ideas, check availability and register with just a few clicks, or at least a mildly interesting way to waste some time—you decide. This is a slick tool that enables you to easily create a graphical HTML social media email signature for use with most common webmail services (Gmail, Yahoo mail, AOL, Hotmail etc.). WiseStamp lets you control the look of the email signature as well as adding RSS feeds and social networking links like LinkedIn and Facebook. Concise review of ooVoo, a free video chat tool that’s been previously written about here. ooVoo is an easy-to-use tool for conducting video chat with anyone who has a webcam. The brilliant Bryan Eisenberg details more than a dozen tools to help compare or benchmark your site/blog against competitors, including Feed Compare (compare the size of your RSS subscriber base to others), Xinu Returns (shows how your site compares to others on search engines and social bookmarking sites) and Website Grader (provides an overall score for the SEO quality of your site plus competitive comparisons and recommendations for improvement). Finally, Kyle Monson reviews a slew of useful and/or entertaining online tools such as Animoto (automatically creates videos from uploaded music and photos), Jott (a cool and handy speech-to-text conversion tool) and, for researchers, NationMaster, a site which lets you compare countries on a wide variety of statistics ranging from the serious (economic measures, terrorism) to the trivial (softdrink consumption). In the same realm as Basecamp from 37signals, Projjex is an online project collaboration tool that lets you define groups, upload and share files, schedule meetings, assign tasks and send automated reminders. Projjex extends this functionality with cool, practical features like file tagging to simplify search, time tracking and iPhone integration. Serious users will eventually want to upgrade to the fee-based service, but the free offering is robust enough to be helpful tool for small businesses while providing larger organizations with a realistic trial before buying. Lots of bloggers are adding Twitter follow-me buttons and badges to their blogs, but thanks to limeshot, you no longer have to limit yourself to standard light-blue-and-white graphic. Here are 36 variations for a follow-me badge that reflects your color scheme and personality. feedkiller is an rss mixing tool that lets you combine a variety of content into your website or favorite rss aggregator with a single rss feed. It’s free and very simple to set up. MakeUseOf.com notes in its review of feedkiller that “other tools can be used for that purpose (such as) RSS Mixer, Feedoor and FeedBlendr. However what makes FeedKiller standout is the ability to select the number of stories to include from each feed.” What would make it stand out even more is a simple PHP script for including the resulting feed on a website. Overall, this is more for amusement than practical business use (though the inbound link checker is very thorough and accurate). dnScoop is a domain check and website valuation tool that estimates the value of an established website or a domain name using several different criteria including the number of inbound links; the popularity, age and Pagerank of the domain; website traffic; and other factors. Mert Erkal, Chief Editor of Bloghology Magazine, shares his favoriate free web applications, including ADrive, an online service for storing, transferring and sharing very large files; Audacity, a powerful open-source audio-editing program; and LogMeIn, a free remote-access service similar to GoToMyPC. Although ZIP is the most commonly used format for file compression on Windows PCs, several other compression formats actually do a better job of producing more compact files. If you ever receive archives in these formats (such as RAR, 7z or KGB) and can’t open them, or you’d like to be able to use alternative formats, this handy utility converts archives between numerous compression formats. Quintura is an alternative search engine developed in Russia, based on semantic technology. What sets it apart from the crowd of other alternative search engines is the way it presents search results in Web 2.0-style clouds of related search terms that help you narrow or expand your search simply by clicking your mouse. The folks at Pandia explain here how you can now use the same technology to spider and search your own site or blog—for free. Here’s a list of 79 social submission bookmarklets you can simply drag to your Firefox toolbar to install. The list includes direct links to register for each service, login and submit a new item, as well as each site’s Pagerank and Alexa rank. This is social posting for the lazy (or extremely busy). This isn’t actually a new tool but rather a collection of neat tricks for using Google to accomplish a range of tasks, from simple things like tracking flight status and calculating currency conversion to more advanced activities like finding free music, filtering image search results and evading your company’s site blocking software (ahem, not so sure that last one is a good idea, but it’s an interesting trick). These have been compiled by Gina Trapani, best-selling author of Upgrade Your Life: The Lifehacker Guide to Working Smarter, Faster, Better and Lifehacker: 88 Tech Tricks to Turbocharge Your Day . A search tool that provides “unlimited space,” enabling you to search Google, YouTube, RSS, eBay, Amazon, Yahoo!, Flickr and Images all in one 3D space. SpaceTime’s™ 3D Web Search lets you choose a search engine from the drop down menu, type in your search term and view all your search results at once in a slick 3D interface. It’s not quite something you can’t live without, but it is a fascinating and cool new way to search the web, find videos and shop online. This is about as simple and elegant as web tools get. Hey, why waste twelve bucks on an alarm clock when you can make your $900 PC perform the same function? As with the Lifehacker post above, this isn’t a tool but rather an exceptionally useful collection of tips and tricks, in this case for Gmail users. Learn how to master Gmail’s keyboard shortcuts, streamline the process of adding attachments, quickly switch between multiple Google accounts, read your Google Reader RSS feeds from within Gmail, use Gmail as an external hard drive, back up your email account and more. 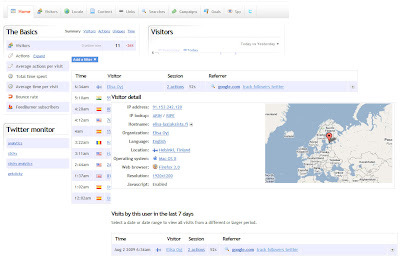 Google Analytics evangelist Avinash Kaushik offers a free on-exit web survey tool featuring three simple questions to help site owners determine why certain pages get visited much more frequently than others, why certain pages have higher exit or bounce rates, and other critical information, using real data rather than idle speculation. Erick Schonfeld reported a few months ago that custom web startup page provider Pageflakes had been acquired by LiveUniverse. Pageflakes is a cool tool for making the web your own, similar to Netvibes or TopNetPix, and has been covered in this blog before, most recently in January of this year when several new features were added to the tool. Under its new ownership, the tool so far keeps getting better. A collection of a dozen cool webmaster tools including Mark Alert (provides an alert anytime a domain uses your trademark), detailed uptime reports on web hosting providers, DNS Tools (whois, traceroute, and ping), Domain Monitor (a free tool to monitor all your domains) and more. A key component of web presence optimization, or webbiquity, is writing and posting an effective online profile. This is equally true for consultants, individual proprietors any executive or public-facing employee in a company. Your profile is not only a key tool in selling you services or organization, but also a gateway to additional information about your expertise or products. It should be a little bit about you and a lot about your, or your firm’s, unique value proposition. Current: The information you share about yourself and/or your company should be revised regularly to keep it up to date. A profile that contains old or obsolete information is not only misleading, it just plain looks bad. Complete: This doesn’t mean a profile needs to contain every detail of your life; most people probably don’t care where you went to junior high for example, and extraneous information only dilutes and unnecessarily lengthens a profile. It does mean, however, that an effective profile should contain all of the information your “customers,” whether they be buyers, investors, potential clients or hiring managers, donors, peers and others can find all of the essential and expected information about you there, including a photo, contact information and links to related resources. Concise: This may seem to be the opposite of the previous point, but it’s not: again, your profile needn’t contain excessive detail, just the essential information you want people to know. It should include your or your company’s unique value proposition, for example, but doesn’t need to include every proof point for every product or service value statement. You may want to include some client success examples, but don’t need to post a complete client list. And you may want to share some background about your organization, but don’t need to include a detailed company history. Basically, people are busy—tell `em everything they need to know, but no more than that. Competent: An effective online profile should be crafted as carefully as a resume (which effectively, it often is). Be careful to avoid typos and misspellings, use complete sentences, proper grammar, and appropriate vocabulary. Mistakes will reflect poorly on you and your company. A poorly crafted profile may be viewed as a sign of sloppy workmanship and lack of attention to detail. Compelling: While a profile should of course be factual, it shouldn’t be a mere collection of facts. Why are you, your company, your products and/or services special? What unique benefits will someone gain from hiring you or buying your goods? An effective profile should make the reader want to learn more or take some other action. Connected: Take advantage of the opportunity in your online profile to link to additional resources—your blog, YouTube channel, website, Twitter account, even other online profiles. This not only drives direct traffic to those venues but also provides SEO benefit. A carefully crafted online profile extends your presence on the web and communicates the qualities you want readers to take away about you or your organization: professional, thorough, knowledgeable and helpful.